The Hilbert Museum of California Art at Chapman University will open five new exhibitions on Saturday, October 7, with a free opening reception from 5 to 8 p.m. The museum, located at 167 N. Atchison Street in Orange, opened in spring 2016 and has already attracted more than 15,000 visitors. Admission to the Hilbert Museum is always free, and it is open Tuesdays-Saturdays from 11 a.m. to 5 p.m. Limited free parking is available in front of the museum with a permit obtained inside. For more information, the public can call 714-516-5880 or visit www.hilbertmuseum.org. The museum will be closed from September 24 to October 6 to install the new exhibitions. “50/50: California Art in Transition, 1940-1970,” curated by Glen Knowles, examines the period including World War II and the following decades, when artists and art techniques from Europe and around the world flooded into California, bringing new ideas of modernism. In California art schools, there was a split, with about half of them teaching the new modernism and abstraction, and half adhering to conservative representational methods. This exhibition shows how an exhibition of the time, presented by a California gallery or art school, would have looked. “American Illustration: Children at Play” marks the official opening of the Hilbert Museum’s new American Illustration gallery, focusing on the accomplished artists who create illustrations for magazines, books and other publications. This first exhibition spotlights magazine illustration from the 1920s to the 1950s featuring an idealized view of American childhood, with artists including Joe DeMers, Stevan Dohanos, Andrew Loomis and more. “Making Waves: A Tribute to Rick Griffin and John Severson,” curated by Gordon McClelland, salutes the two masterful artists who contributed so much to the surfing culture in California and elsewhere. This exhibition includes Griffin’s influential painting “Pacific Vibrations,” along with Severson’s thrilling surf paintings and a collection of surfing ephemera, zines and posters. “The Magic of Disney Art, Featuring Pinocchio,” in the Animation Art gallery, spotlights four newly acquired original animation cels from the 1940 Disney classic about the puppet who wished to be a real boy. Also on exhibit will be animation art, concept art and more from many other Disney movies, including Lady and the Tramp, The Jungle Book and more. Many of California’s best-known artists worked for the Disney Studios, including Eyvind Earle, Mary Blair, Phil Paradise, Phil Dike and others represented in the Hilbert Collection. “California Masters: Bradford J. Salamon” features the acclaimed Los Angeles artist’s works from the Hilbert Permanent Collection, focusing on his monumental “portraits” of vintage objects, food…and Star Wars robot C-3PO. In addition, a selection of works from the Hilbert Museum’s permanent collection will also be on view, featuring paintings by such California artists as Emil Kosa Jr., Frank Romero, Millard Sheets, Milford Zornes and many more. 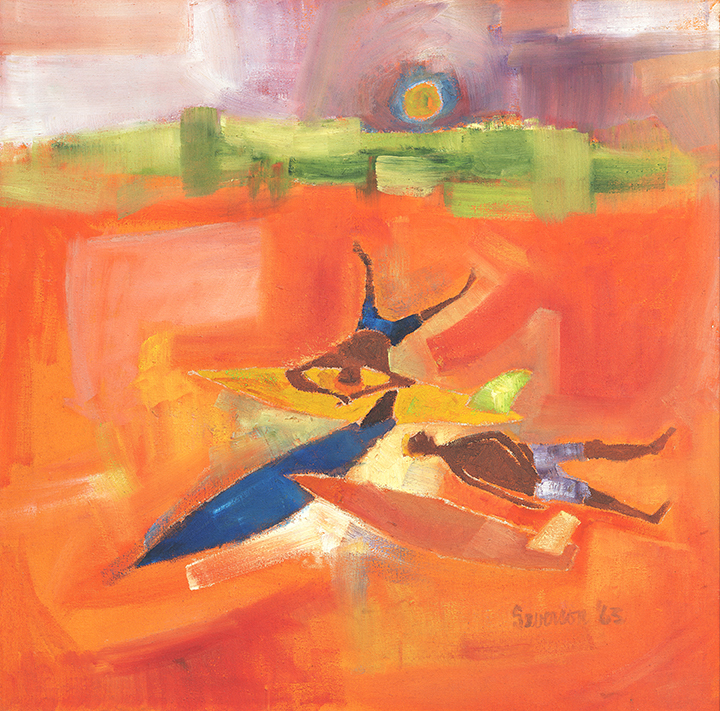 A portion of the Hilbert Collection of more than 1,000 paintings – mostly works in watercolor and oil created from the 1930s to the 1970s by such luminaries of the California Scene movement as Millard Sheets, Emil Kosa Jr., Mary Blair, Phil Dike, Milford Zornes and Rex Brandt, among others – is always on display in the Museum. In addition, rotating temporary exhibits are regularly scheduled. 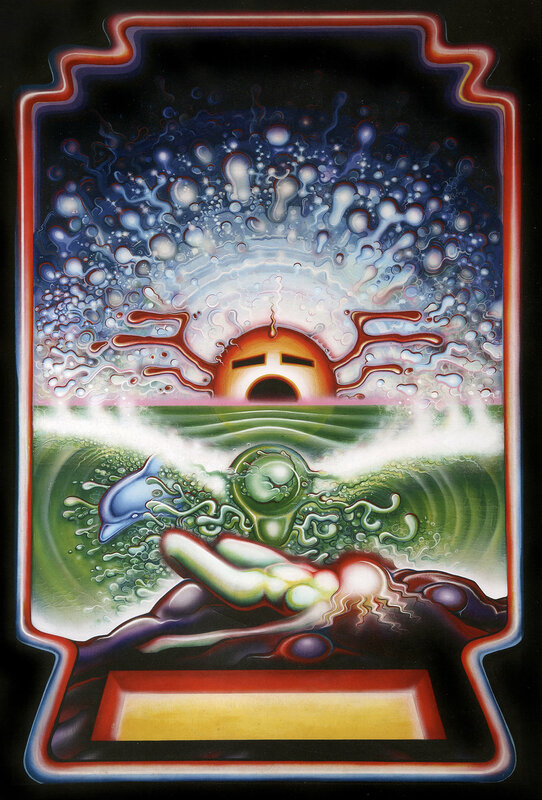 Rick Griffin, "Pacific Vibrations," 1969, acrylic on Masonite, 43" x 29". Courtesy of Jay Guold. John Severson, "Surf Be Bop," 1963, oil on canvas. Courtesy of Louise Severson.